1983, Starring Peter Strauss, Molly Ringwald, Ernie Hudson, Michael Ironside. Directed by Lamont Johnson. 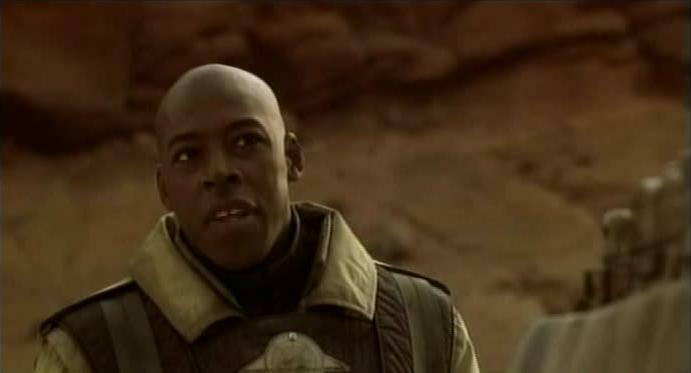 An all star Canuxploitation effort, Spacehunter features a toque-full of talent: Lamont Johnson (The Groundstar Conspiracy) directed this film, based on a story from Jean Lafleur (The Million Dollar Hockey Puck), and it was all executive produced by Ivan Reitman (Cannibal Girls). Is it good? Actually, it isn't that bad at all. Sure it's always annoying to watch Molly Ringwald chew on her lips, but unlike many of the films I have reviewed it has production values, and some entertaining moments. And it's Canada's other 3-D film, after 1961's The Mask. 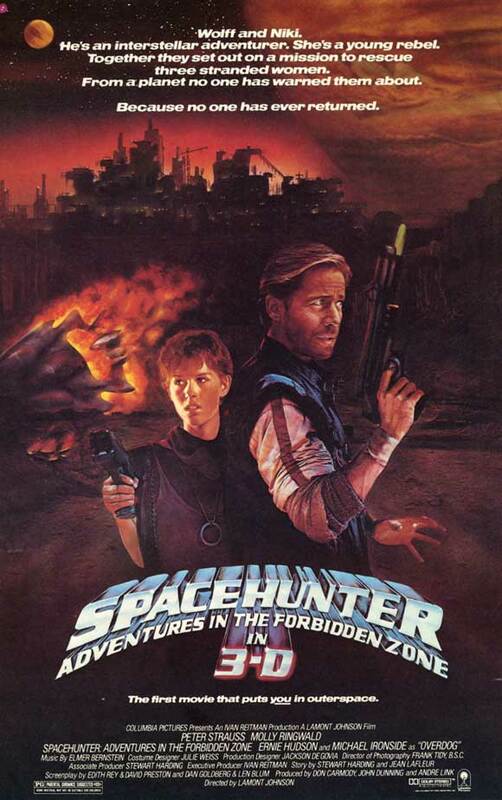 The story of Spacehunter begins when, for no apparent reason, a large spaceship blows up. An escape pod filled with three young space vixens crashes on a nearby type "E" planet (that's " E" for "Earth," the computer voice reminds us). The escape pod then sends out a homing signal picked up by our hero Wolff at his space outpost. The reward offered is so high that he takes his lingerie clad girlfriend and his dune buggy down to the planet to see if he can collect it. Wolff rides his dune buggy across the desert until he happens upon the three girls riding with some locals on a train with giant tattered sails. Suddenly, a huge battle breaks out between a the ship, motorcycles with roll cages, and more laughably, jet engine propelled hang gliders. Many of the inhabitants of the planet seem to be subscribe to the ever popular "futuristic yet dusty" look made so popular by the extras in The Ice Pirates and Mad Max. The battle ends when the evil hang gliders, or " Vultures," steal the three ladies and take them back to the "Forbidden Zone." In the process, Wolff's girlfriend gets killed, but it's okay, because we find out that she is a robot. What Wolff is doing dressing up robots in lingerie is not fully explored in this movie. 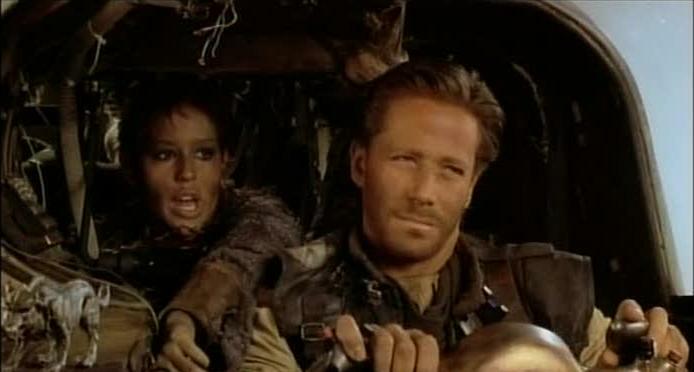 Wolff decides to follow them into the Forbidden Zone where one would surmise many adventures await our spacehunter. On the way he meets Molly Ringwald, who plays a dirty scavenger girl named Nikki the Twister (who has a manicure, in one closeup). Nikki offers to help guide Wolff to the Forbidden Zone to fight metal clawed bad guy Overdog (as played by Canadian film mainstay Michael Ironside). In return, he promises to give her food and to let her fawn all over him. This leads to a series of encounters with strange creatures as they make their way to rescue the girls. 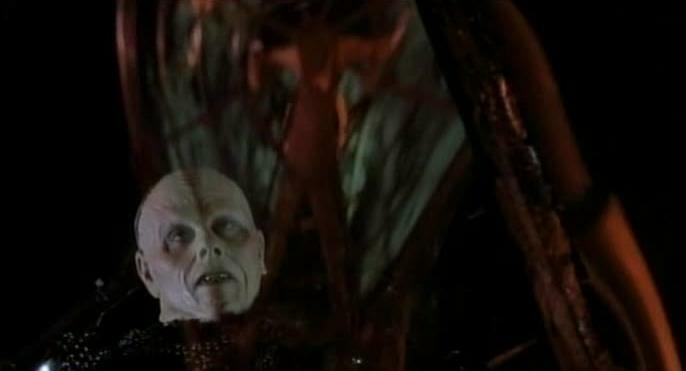 No less than three times do Wolff and Nikki act out a variation of the scene in The Empire Strikes Back when the Millennium Falcon flies into the giant worm creature. Our heroes settle down in an apparently safe area when suddenly they realize they are surrounded by dangerous creatures and barely escape. 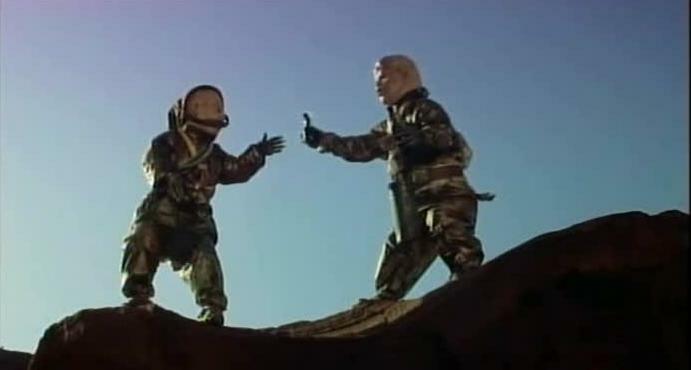 This repetitiveness is finally broken with the appearance of Washington, (Ernie Hudson, who later starred in Reitman's Ghostbusters) a rival spacehunter who calls a temporary truce to help save the girls. After meeting up with some bomb throwing midgets, Team Wolff finally makes their way into the Forbidden Zone, which as you can probably guess is dirty and dark, with lots of neon lights and bad guys with eye patches. As Wolff and Washington make their way towards the girls, Nikki gets caught sneaking around, and Overdog puts her in a giant booby trapped maze. Up to now, there hasn't been a heck of a lot of 3D effects in Spacehunter. Sure the molitov-cocktail wielding midgets were cool, but Overdog's crazy maze is the best place to showcase some screen popping effects, and it doesn't disappoint. Being Nikki the Twister, Molly easily makes it through the maze. Her amazing resourcefulness actually turns on Overdog, who asks if she will take his huge metal claw in marriage. Meanwhile, Wolff and Washington find and release the girls, but then Wolff realizes he has to go back for Nikki. The very cliche of "Space Rogue with a Heart of Gold," the character of Wolff owes quite a bit to Star Wars. Sure he likes to get it on with robots and 12 year-olds, but at least he manages to make it through the film without kissing his sister. Like many Canadian films, Nikki and Wolff are loners who are looking for some sort of family, for a sympathetic community. Not surprisingly, they find temporary comfort with each other, in a Felix and Oscar kind of way, anyways. Overall, Spacehunter is not that bad. 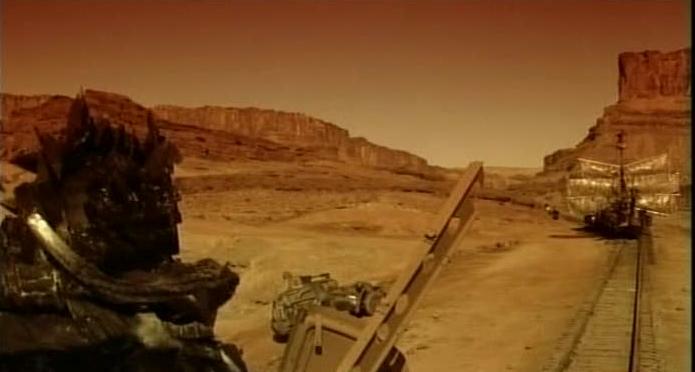 The production values are much higher than many other Canadian science fiction epics such as Abraxas or Millennium. The music however, is not. But fans of new age celtic rejoice there's enough elfen flute ballads for everyone.